The 300 SL was already an enormous success by the time of the Roadster’s unveiling at the 1957 Geneva Motor Show, however the refined nature of the Roadster ensured it would become a foundation of Mercedes’ open coachwork grand touring cars. The Roadster’s undeniably luxurious character generally obscured its performance capabilities. Whilst visibly a sibling of the 300 SL Gullwing, the Roadster was largely redesigned, featuring a revised tube frame with lowered door sills allowing far easier access to the cabin, which courtesy of the reclining soft-top was never subjected to the uncomfortably hot temperatures which plagued the Gullwing. Another advantage of the later developed Roadster was in the engine bay, the 2996 cc engine was now fitted with the competition camshaft, previously only fitted to the NSL racing Gullwings, leading to an increase of 20 horsepower. The rear suspension was also revised, reducing the cars tendency to oversteer thanks to a lower axle pivot-point. The Roadster we are offering, chassis 198.042.10.002516, and was delivered new to Mr Oswald Werner, a resident of Davos-Platz, Switzerland, on 24th April. This car was first registered in Switzerland on the same day and issued license no. ‘GR 8430’. 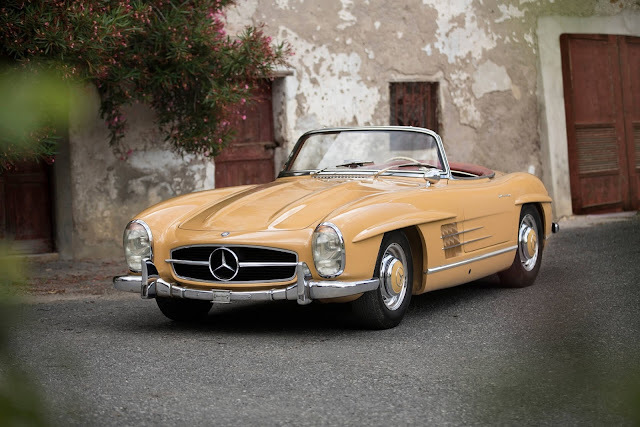 Interestingly, the car was painted by Mercedes-Benz in the fabulous colour we see today, called ‘Senf’ (mustard), although the colour was not publicly available, only to a single very important client. This car was later seen by another client of Mercedes-Benz, Mr Berthold Beitz, president of the Krupp Foundation, who immediately requested his 300 SL be painted in the same colour. However, Mercedes-Benz politely responded saying it was not possible as they promised the client of this car that the colour would be a one-off, and so this is the only 300 SL Roadster finished in Senf. The original Service Booklet still accompanies the car and notes the original engine number as 198.980.10.002564, which it retains to this day, along with its Owner’s Manual and tool kit. The car was also supplied new with a factory hardtop, allowing the owner to enjoy the car either open with the wind in their hair, closed with the soft top, or closed with the desirable optional hard top. An original service book is a very rare find with a 300 SL Roadster, but this service book also has many stamps confirming this car’s early service history. In September 1964, this car was serviced by Gebr.Gruger in Switzerland with the mileage noted as 30,100 KMs, clearly Mr Werner was enjoying his ownership of this fabulous roadster. The mileage continued to steadily increase over the following years, in 1966 again the car was serviced, this time displaying 36,128 KMs. By 1983 the car had changed ownership to Mr Morigi, from whom we recently purchased the car, and was being serviced by Mercedes-Benz Automobil AG, Zurcherstrasse, and displayed 66,180 KMs. Mr Morigi was a close friend of the first owner, and recalls how he came to purchase the car. Having just completed the restoration of his Lancia Fulvia Zagato, Mr Oswald commented that this was “the car for me”, and in return Morigi commented that the 300 SL Roadster was “the car for me”! At this point Mr Oswald was too old to regularly use the car and felt Morigi was a good second owner with an ever-growing collection, a sale was quickly agreed. The Mercedes-Benz 300 SL was always a very special car for Mr Morigi who recalls a missed opportunity earlier in his life. In 1957, using his temporary driving license, he drove himself and three friends from Ravenna to Bologna for a Paul Anka concert in his Lancia Aurelia B10. Sadly, they left the road and the car was expected to cost 200,00 Italian Lire to repair. Morigi consulted with his friend Cesare Perdisa, an Italian race car driver, who suggested he should instead invest more money and buy a 300 SL Gullwing, previously owned by actress Sophia Loren. Unfortunately, Morigi chose not to purchase the Gullwing, but always regretted his decision, and when the opportunity arose to obtain this roadster, he did not make the same mistake! The service history continues with stamps from Mercedes-Benz service centres in Lugano and Salzburg before the car participated in the 1993 and 1995 annual Kitzbuheler Alpen Rallye. Austria was one of the first countries to switch to unleaded fuel, and in 1993 Morigi consulted with Mercedes-Benz who confirmed the car would continue to run without issue. However, Morigi quickly ran into engine issues after refuelling in Austria and returned the car to Salzburg where he commissioned a complete engine rebuild. Later, in May 1998 this car was also issued its DUEVET FIVA Vehicle Passport, number 1361. Today the car is offered with its original factory hard top, service booklet, owner’s manual and tool kit, a rare combination, but when combined with its one-off factory paint finish, this car really is a unique opportunity to obtain a hugely original example of one of the world’s most iconic roadsters. Contact Girardo & Co for more details.